ROSS & ELIZABETH were married at Wharerata in January 2014 and Artisan Media was present to capture the ceremony. 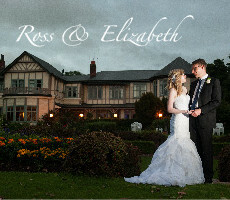 With family and friends surrounding them, Ross & Elizabeth were married in the tranquil setting of Wharerata. The celebrant, Kevin McFetridge, was a family member and wore a classy hat for the ceremony. He demonstrated a witty sense of humour as well as a sensitive side as her walked through the ceremony. One awesome idea was their ‘time capsule’ – a bottle of wine and messages to each other – to be opened on their 5th anniversary. Thank you so much for all your help capturing all of the magical memories on our special day. We love what you have produced and will always treasure it. You provide an excellent service; we were very impressed and would certainly recommend you to others. We have just finished watching the video and I wanted to tell you that we were absolutely blown away. You have done an incredible job of capturing every moment. We really want to thank you for the time and care it would have taken to make such a polished product, and for the fact that you have been so great to work with. Having the video is extremely special and we were really touched to be able to relive the memories again. We will treasure that forever. Thank you so much for all your help and for providing such an excellent service. We would certainly recommend you to others.